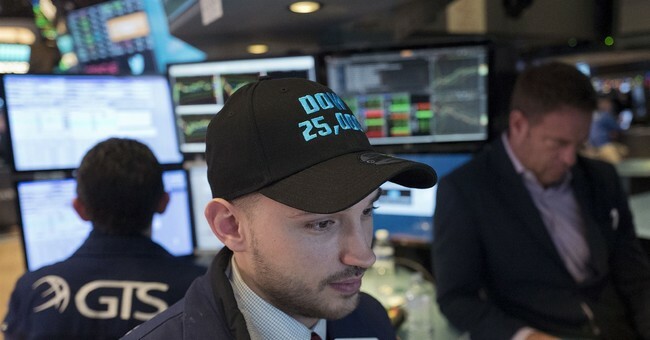 What a way to start the new year—the Dow hitting 25,000. This is the shortest period of time in the history of the index that a move of 1,000 points has happened in just 23 days. From a market perspective, I am not looking for a 2018 to be what 2017 was. I’m not looking for 23 percent to 25 percent gains in the indexes. But I think with the cutting of more regulatory burden for large companies down to small businesses, tax reform adding to corporate earnings and an unparalleled business sentiment and consumer confidence, not to mention bringing home to America trillions of dollars, it will be almost impossible not to see 12 to 15 percent market growth (barring any major geo-political events). But expansion in our economy, not just the markets, is the real story. Growth in corporate earnings, just by way of tax reform, could keep markets increasing and bring valuations in line. This will continue to create more corporate enthusiasm for growth and expansion. Ultimately, markets aside, it will be about the expansion and growth of the underlying fundamentals of the economy. I believe that 2018 will put us on the path of consistent 3 to 5 percent GDP growth over many years, and that will help shape the economic environment for many years to come. I know many people are concerned about the national debt as am I, but one thing is certain—it is impossible to solve any national debt problems in a 2 percent GDP growth environment. As a matter fact, I would argue that is not growth at all, but simply allowing a lousy economy to stay a lousy economy and not get any worse; it is barely enough to keep pace with population growth. With a growing GDP, good fiscal policies coming out of Washington, a pro-growth agenda and continued efforts to create a pro-growth environment, a successful, strong and thriving economy will be unstoppable. On top of all this, we need the continued cutting of unnecessary government spending, removing duplicity throughout government agencies, being better stewards of who we are giving money to around the world, and the abolishing of a congressional attitude of always looking to gain more power and social control. These dollars can be saved and spent in other areas. I believe we are beginning to see much of our political establishment embrace the very changes they were so afraid of. We can be certain that this economic growth is not just about the 2018 optimistic outlook. This is optimism of an entire generation—economic strength leading to balanced budgets, strength in American defense like we have never seen, and efficiencies and effectiveness in the United States government that has not been seen in perhaps 150 years. Why is this happening now? Because the American people have decided it is time for the introduction of the free market, allowing corporate American business to thrive, instead of the self-serving, elitist, political structure that has completely failed America. This revelation didn’t start off with very high expectations, but now we witness and give testimony to the power of strength, persistence and steadfastness and an unwavering path that cannot be bought, lobbied for or shaken by political poll numbers or political pundits. This new path is based on one unshakable idea—making America great for the American people. This has been shaped by a president who doesn’t need to be liked by the work, and he doesn’t want to be president of the world either, but rather to make America great for generations. This will be done, as the president said, by “unleashing the American spirit” to be the home of the brave and land of the free, where opportunity, innovativeness and ingenuity will thrive. America can again be a land where people will come and work for the great American dream.